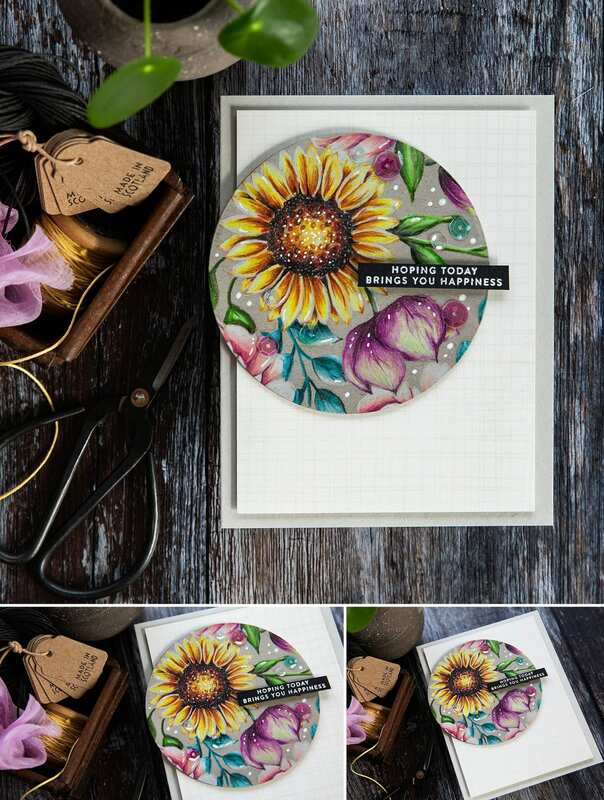 Today’s post is part of a blog hop to celebrate the new Blossoms And Butterflies release from Simon Says Stamp – more on the hop below. 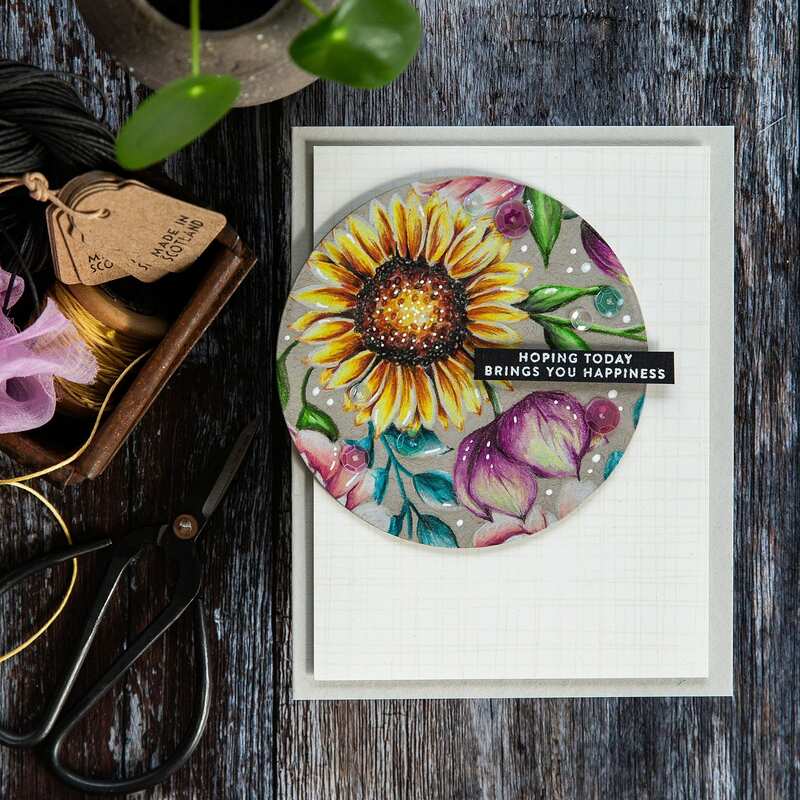 I do love florals and was immediately drawn to the beautiful Floral Mix Background set. I’ve linked all supplies at the end of this post. Compensated affiliate links used where possible at no cost to you. Second to watercolouring, coloured pencils on kraft has to be my next favourite way to colour. 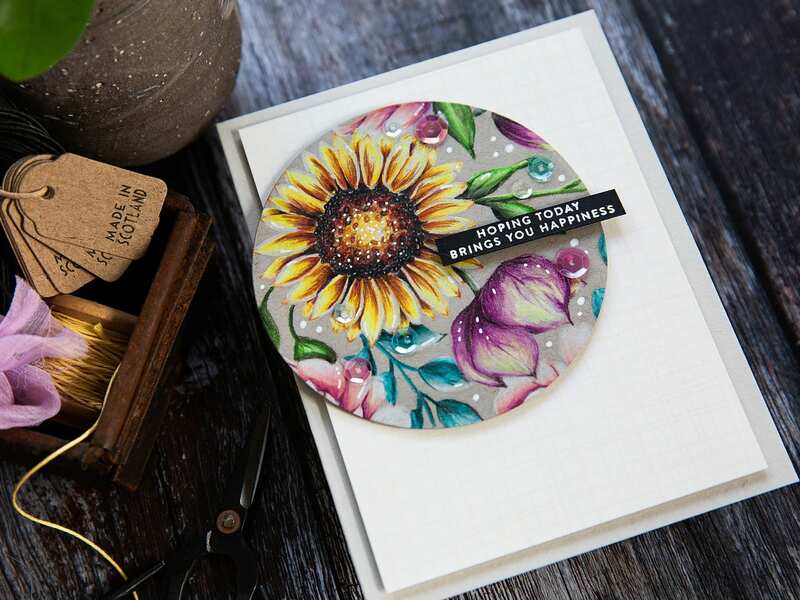 I particularly like the smooth, cool grey of Toned Gray paper from Strathmore when using coloured pencils and stamped the Floral Mix Background in Whisper from Gina K. I’m really enjoying using this ink; it is a pale ink so that it disappears and yet gives you a visible guide when colouring. I then took my time and enjoyed colouring in a bunch of gorgeous flowers with Faber Castell Polychromo pencils. I also added a few white gel pen details too. 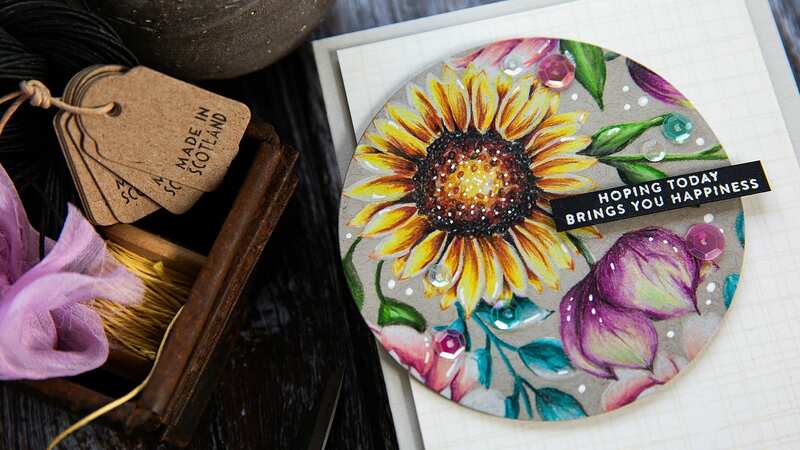 I then die cut a circle from the background with a Nested Circle die. For the sentiment, I stamped a greeting from the Tiny Words Encouragement set in clear embossing ink on a Black card and white heat embossed before trimming to a skinny banner and foam mounting over the colouring. I cut a panel of Ivory card and stamped the Sketchy Lines Background in Whisper ink (I can see this ink becoming a firm favourite) to give a little more interest to this simple design and then mounted the Ivory panel on a Fog card base before mounting the pencil coloured circle on top. I added a sprinkling of Enchanting sequins to finish. 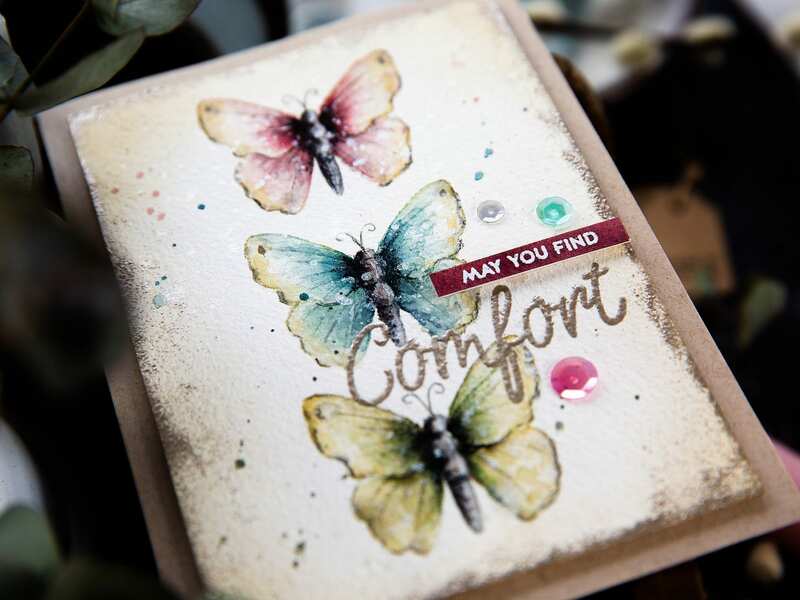 For more inspiration from the release, here’s a watercoloured butterfly card I made using the Comfort & Prayers set. You can see that post here. 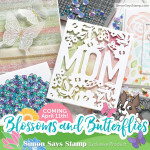 As mentioned above, this post is part of a blog hop to celebrate the Blossoms & Butterflies release from Simon Says Stamp. Hopefully, you’ve arrived here from Simon’s blog but if not then that is a good place to start. As with all good hops, there are prizes! 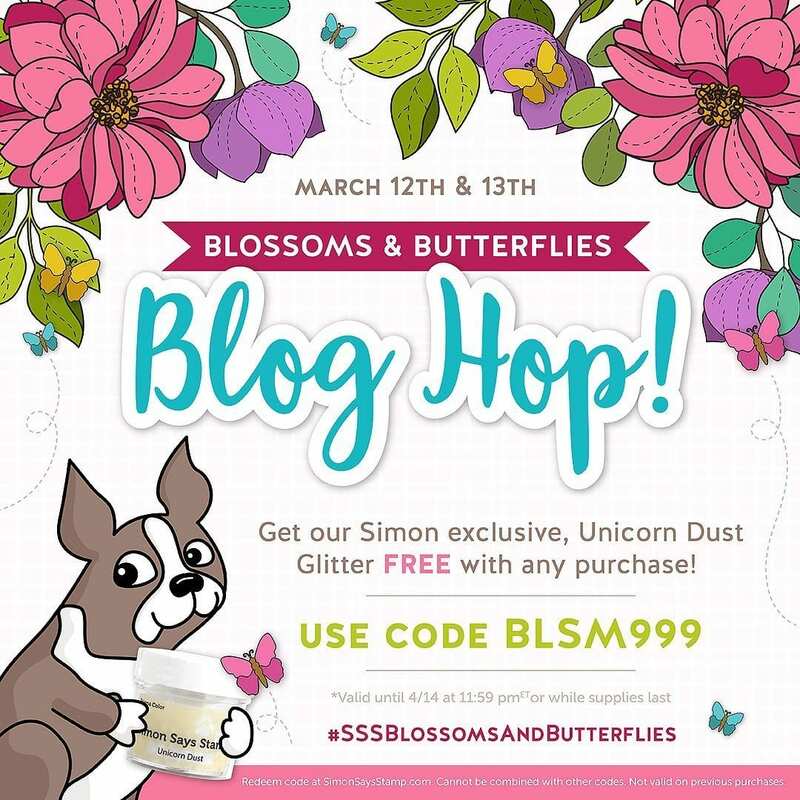 Use the code BLSM999 for a free jar of Unicorn Dust Glitter (while supplies last!) with any purchase. The code will expire Sunday, 4/14 at 11:59 pm EDT. Simon is giving away a $25 coupon to every stop on the hop from the blog comment section. They’ll choose winners over the weekend and post on the Simon Says Stamp store blog on Wednesday, the 17th of April. I don’t think there’s a thing you could make that I wouldn’t love. I just love your color choice and your coloring technique; it makes every piece something truly special. Thanks for sharing all your creativity with us! Beautiful coloring! I love to color with colored pencils on Kraft cardstock. LOVE! So bright and beautiful. I can’t get enough of your colouring (pencil and water). Beautiful design and love the coloring on kraft. Beautiful colouring on kraft…love the look it creates.